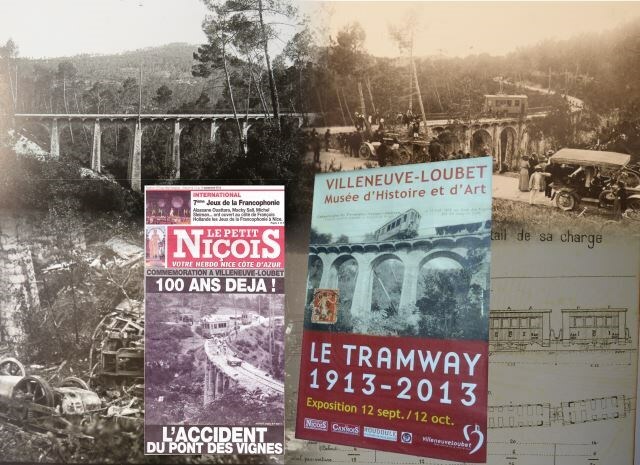 Construction work started late in 1910 and the section from Grasse to Pre du Lac opened on 1st March 1911.The extension to Cagnes opened on 30th December 1911, and the Branch from Pre du Lac to Le Bar sur Loup opened on 1st October 1912. The tramway remained open only until 1929, with the final journeys taking place on 16th May 1929. On 17th September 1913, the line experienced a major accident. The worst that happened on the TAM network: the derailment of tram 428 at the Pont des Vignes. This led to many controversies and reports, but also improvements in the safety arrangements on the line. 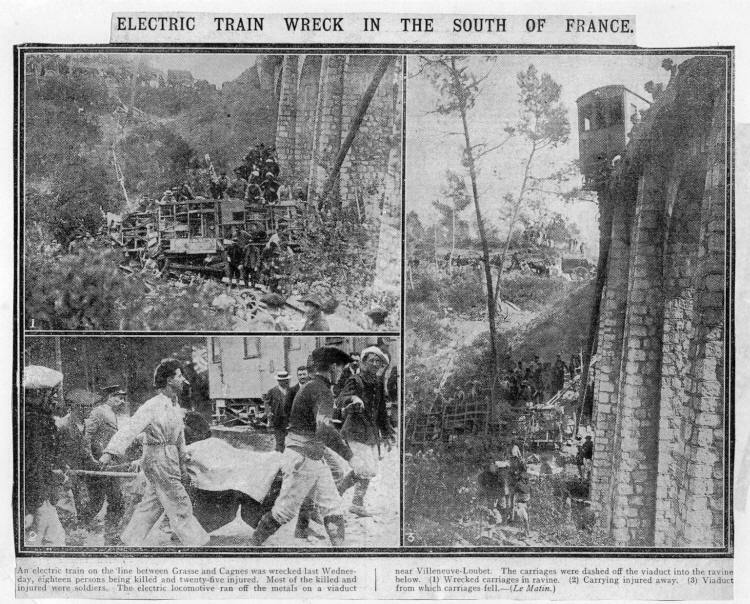 Ultimately, the accident was probably primarily responsible for the early demise of the Grasse-Cagnes line. 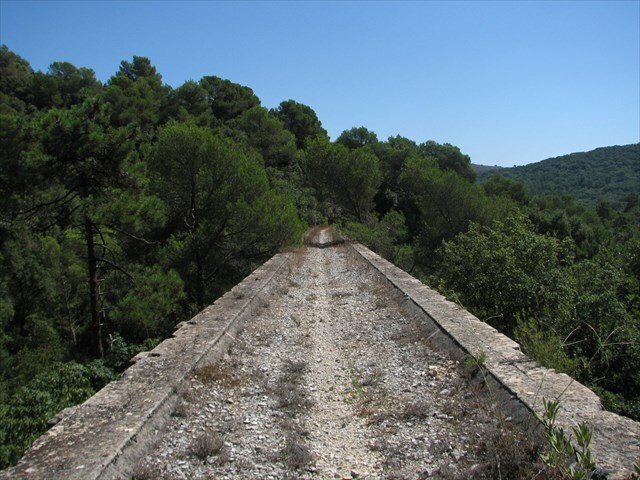 After the Great War, the section Grasse-Cour to Grasse-PLM, was closed in May 1921 as a result of competition from the funicular railway. On 31st October 1923 there was nearly as significant an issue as on 17th September 1913. Tram 202 almost experienced the same problem at Le Pont des Vignes but finally derailed without too much damage further along the line near La Vanade. On 3rd January 1925, a tram began to accelerate on icy rails close to the viaduct, fortunately the tram was stopped without derailing. 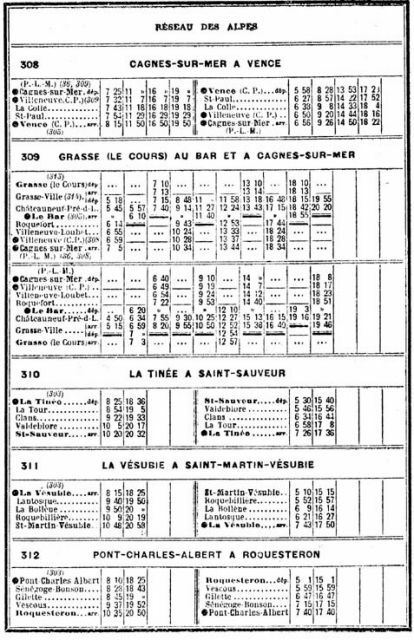 In addition to these incidents, there were others of a less serious nature which were deemed to be the result of aging equipment and poorly maintained track, precipitated the decline of the tram and the Grasse-Ville / Grasse-Cours section closed in November 1925. Competition from road transport and financial deficit, provoked the end of the line in 1929 and the official liquidation in 1930. So what was it that happened in September 1913? Wednesday 17th September 1913, stormy was a stormy and wet day. Tram train 428 from Grasse-Ville to Cagnes-sur-Mer departed on time at 16:36hrs. It consisted of self-propelled Bam-205, Aam-114 and trailer Bam-3108 and was driven by Jules Leotardi (25 years old) who had been with the company since May that year, having been authorized to drive trains in July. He was accompanied on the journey by Honoré Sauteron, a 25-year-old student who had been hired for 12 days and whom he was training. In Pré-du-Lac, the conductor Louis Agnelly (33 years old) harnessed the trailer Aam-3010, without connecting the continuous brake because Leotardi judged that to do so would increase the consumption of air and instead of improving the braking of the train, would lengthen the reaction time. The tram was full, very full in fact. Several units of alpine soldiers were returning to their garrisons on the coast after having participated in manoeuvers in the Grasse region. The soldiers of the 27th BCA, who were camped near Chateauneuf, also embarked to return to their quarters in Menton. Shortly after, at following stops, soldiers from the 24th BCA who had left their bivouac at Rouret to return to their base at Villefranche joined the tram, as did some 2nd RA gunners and civilian travellers. The tram train was already quite full before others joined the tram at San-Peire, St.Pons, Le Collet and Les Moulins. Thectram was so crowded that a short stop was made at Rigamel to allow the conductor to change cars in order to continue selling the tickets. 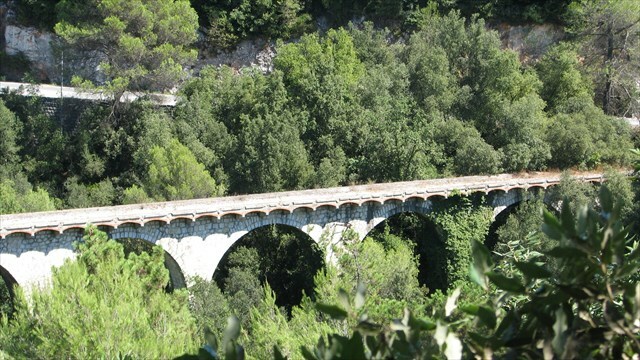 The train stopped again at Roquefort, then took more passengers at Colombier halt, which it left 15 minutes behind schedule and with seventy-six passengers on board. A fine rain began to fall and the train entered the forest on a steep gradient heading for Le Viaduc de Sept-Fonds. 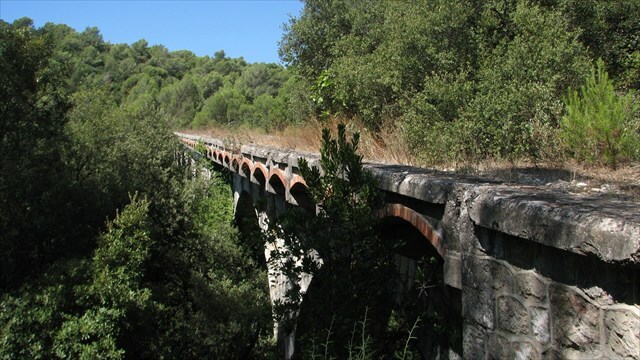 The Sept-Fonds Viaduct is one of the last vestiges of the Cagnes-Grasse tram line. 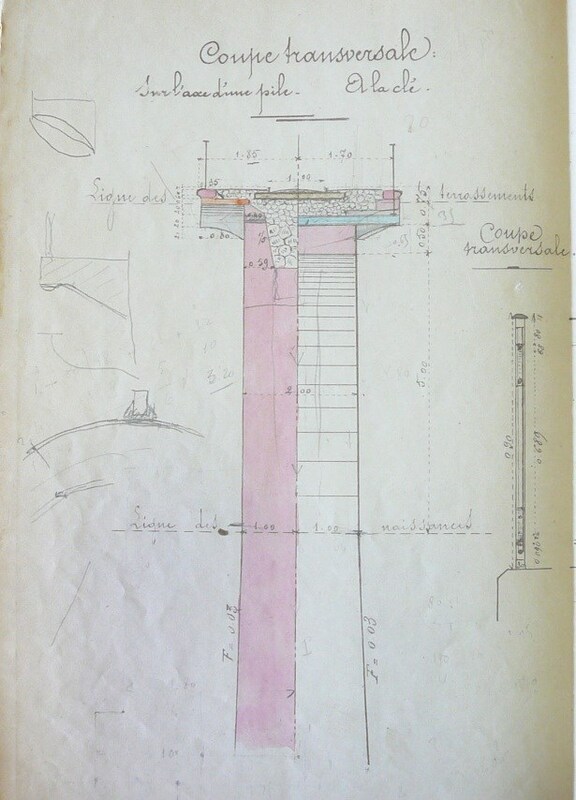 It was designed in 1908 by Armand Joseph Marie Hamon, engineer of the roads and bridges in Grasse. 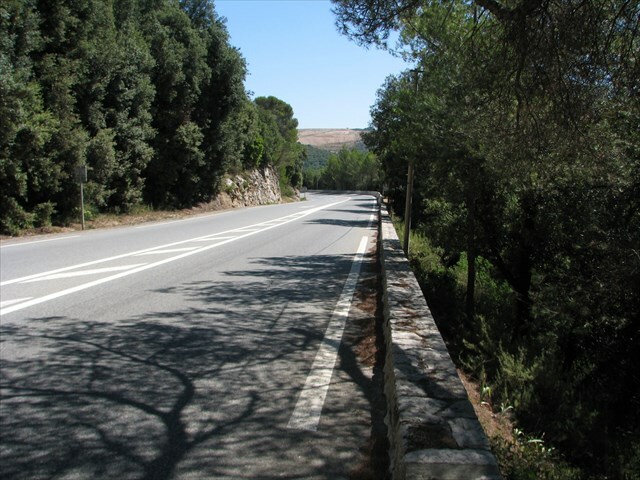 It crosses the Sept-Fonds valley (length: 139m, width: 3.70m, height: 23m at the highest point). 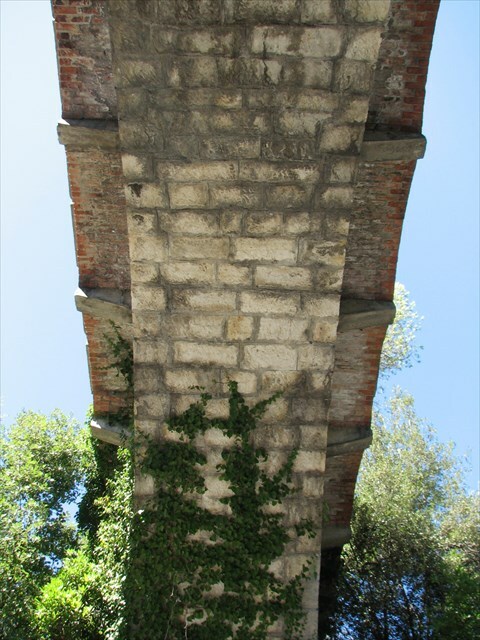 It consisted of 12 semi-circular masonry arches, each spanning 10m. Today, the rails and the wrought iron railings have disappeared, but the masonry is still intact and clearly visible. As the tram-train continued down the line, witness accounts suggest that the speed increased significantly. Leotardi’s tesimony is that when he applied the brakes, rather than slowing the train, the wheels jammed and slipped on the rails. He applied the sanders, but to little effect. As this was quickly becoming an emergency, he invoke instructed procedures which were to release the brakes and throw the power car into reverse gear, but speed continued to increase. 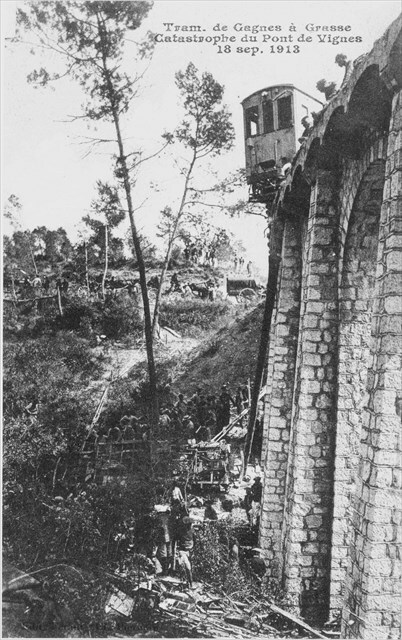 The tram-train reached Le Pont des Vignes travelling at a speed in excess of 65 kilometres per hour. The leading power car seemed to be remaining on the track and so Leotardi took the decision to bring the power control back to neutral. At the same time, in the rear car, the conductor was making his way through the military and their equipment to try to tighten the brakes. An impression of what things were like can be gained from the following two pictures. On leaving the Viaduc de Sept-Fonds the tram followed the line which was tight on the wall in the first picture, soon this wall gave way to an un-fenced section of the line. The tram would have been travelling immediately above the drop on the right-hand side of the second picture. 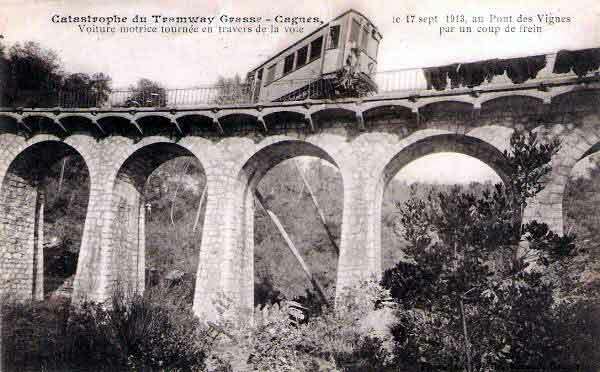 While the conductor was trying to tighten the rear car’s brakes, the tram-train continued out onto the curve of the Pont des Vignes (Cloteirol) Viaduct) and left the tracks, it tore down the telegraph poles and the relatively flimsy guardrails and pulled with it the remaining two cars of the train. 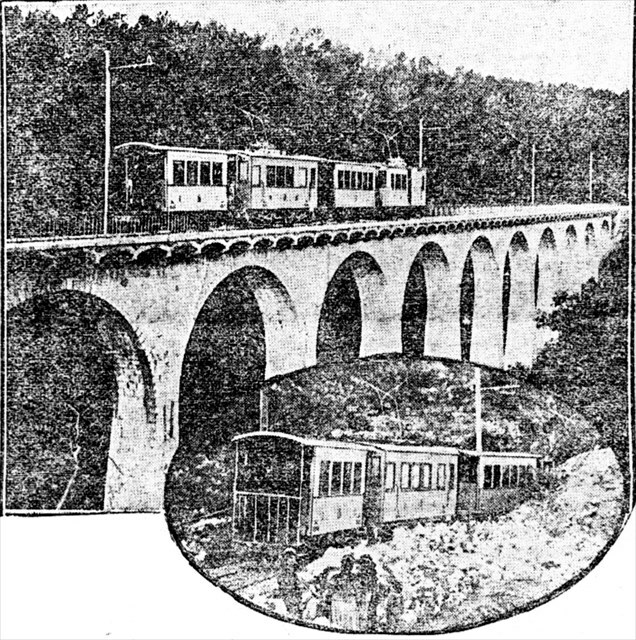 The two rear cars left the viaduct and dropped 13 metres into the ravine. They were severely damaged and threw passengers out onto the hillside. The hitch to the leading car broke and it stopped teetering on the brink. Thankfully, it did not also fall into the valley. It remained on the viaduct but with both ends of the car extending out over the void! The survivors in the lead car did not immediately grasp the extent of the disaster. This changed when they grasped that some doors of their car opened out onto the void and when they heard the cries and lamentations of the wounded and dying at the bottom of the ravine. A few of the passengers recovered enough to clamber out of the tram and went down the line to Villeneuve-Loubet to raise the alarm. 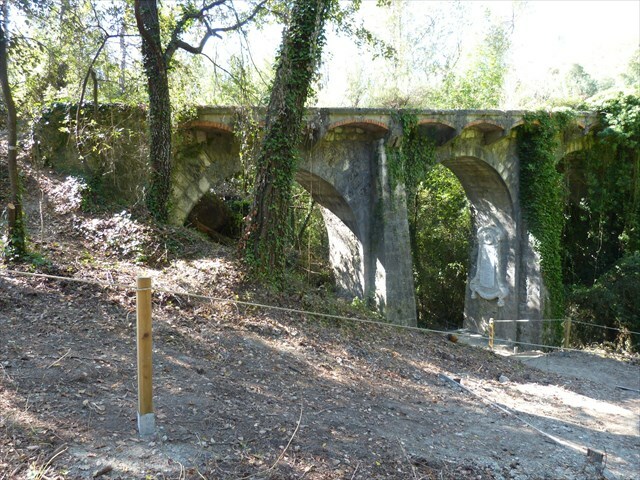 The able-bodied men, including Leotardi, his pupil, and several passengers, descended into the ravine to help the victims. Many people had been thron clear of the wreckage as the tram cars fell, but the most serious cases were stuck in the pile of tram cars and many here were fatalities. 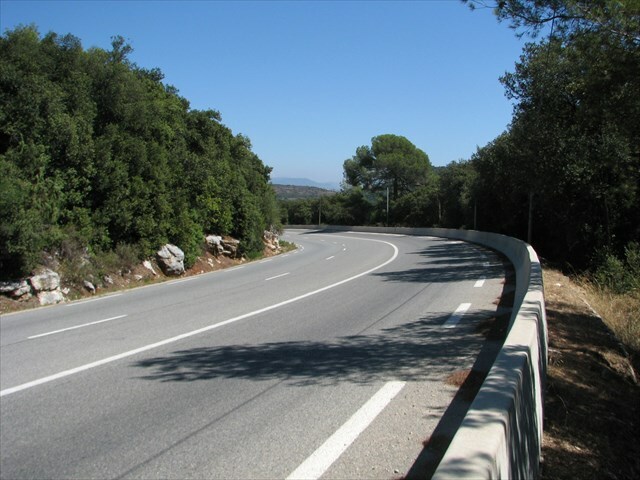 Sixteen people were killed instantly or died in the moments following the accident. Another died that night at the hospital, and another two a few days later. There were 19 dead and 39 wounded. A stone plaque was erected by the Commune on the face of one of the viaduct pillars to commemorate the dead and wounded. This can be seen on the face of the pillar in the second of the pictures below. 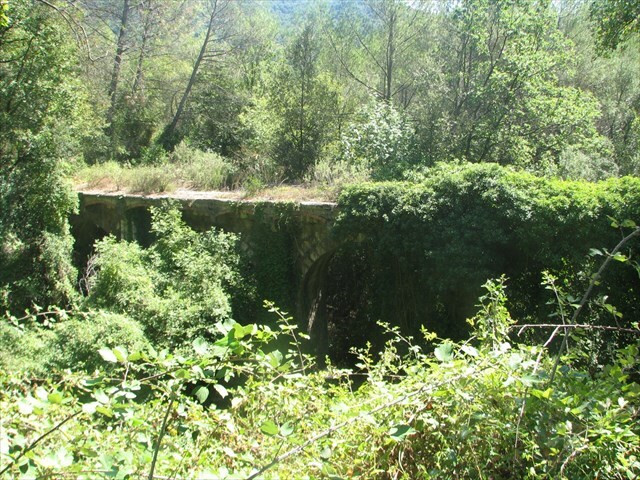 There are two picture below of the bridge in its present condition. José BANAUDO “Le Tram des Vallees” Tramways des Alpes-Maritimes (Editions du Cabri).